EnglishHints also has matching and other games for past tense practice: Concentration Games or Printable ESL Classroom Games. 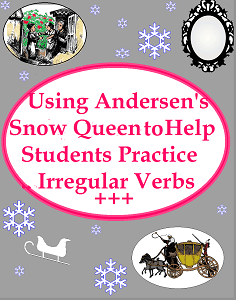 I’m adding a new practice packet, using a shortened, simplified version I made of Hans Christian Andersen’s Snow Queen to practice 50 common irregular verbs. This classic quest tale was the original inspiration for Disney’s Frozen, and is a celebration of the power of innocence, perseverance, and love. Andersen’s descriptions , characters, and unexpected plot twists make it a real classic. I will probably be offering it on EnglishHints (and TeachersPayTeachers and other teacher sites) for around $5-6. However, I have been looking for a bonus to show appreciation to you for your interest in this newsletter and in EnglishHints, so I am offering it as a free download to English Detective subscribers only. It’s a 39-page pdf: 2 pages of teaching suggestions, discussion questions, and follow-up activities, 2 pages each for the seven stories within the Snow Queen, and 7 gapfill worksheets practicing up to 12 new (plus review)irregular verbs with selections from each reading. Download the Snow Queen and past tense practice pdf here. P.S. If you do look at it or use it, I would really appreciate feedback—any comments, positive or negative. You can just “reply” to this newsletter. Thanks!